SykoGrafix: Art - Stuff - Ninja Insanity: TFCon Time Again! The main event of the summer, at least for me, is this weekend! 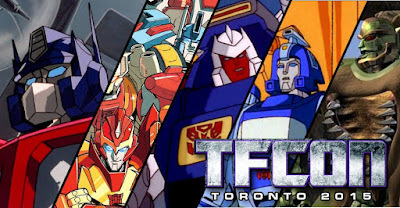 TFcon Toronto takes place in Mississauga, Ontario on July 17th to 19th. And not a moment too soon, because I have been eagerly awaiting this event all year long. I did not do any artwork for the show this year and I'm just attending as a fan. I hope to participate in as many events as I can, including the script reading and the Q&A panels. Perhaps we may even see a reunion of the Ninja Consultants in the Faction Feud. Of course I'll be hunting for bargains at the dealer room too. But, the best part of TFcon is seeing all my fellow fans as we hang around the hotel and catch up with each other . If you're going to be at TFCon, come on over and say hello! Just look for the weird dude in the bandana. I'll be there for the entire show and I can't wait to see everyone and have a chance to chill out and talk about some transforming robots. See you there!